If you and I get to Yelp crowd-sourced reviews of local business, why not Rover and Fido? 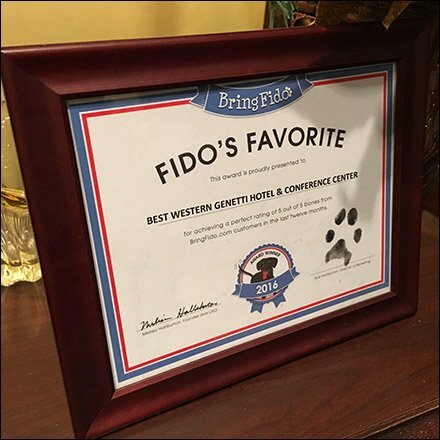 Here a hotel and conference center shows off the best of Hospitality Retail Awards, at lease as pertains to pet, a Fido’s Favorite. This hotel got 5 out of 5 bones by its four legged residents. How do you balance “pet friendly” with “pet phobic” clients. Many establishments segregate the room types so one group never stays in the others rooms. Some have cleaning assault teams that can totally freshen and sterilize a room taking it back to a pristine state. Need a pet friendly environment, the plaque suggests you consult BringFido.com. Seen at Genetti’s Best Western Hotel and Conference Center, Wilkes-Barre PA.